My wife and I took our daughters to see The Nutcracker and the Four Realms Friday night and I have to admit that I enjoyed it quite a bit. I think the most striking aspect of this movie is that it looks exquisite. The costumes, sets, and scenery are gorgeous. It seemed to me that much of it featured real people on real sets. There existed some CGI, of course, but generally speaking it appeared that the actors were interacting with actual props and materials. The movie wielded a certain weight that many CGI-laden films do not. Furthermore, I found the actors and actresses both capable and, more importantly, likable. It’s hard not to like Morgan Freeman and Helen Mirren, though, isn’t it? 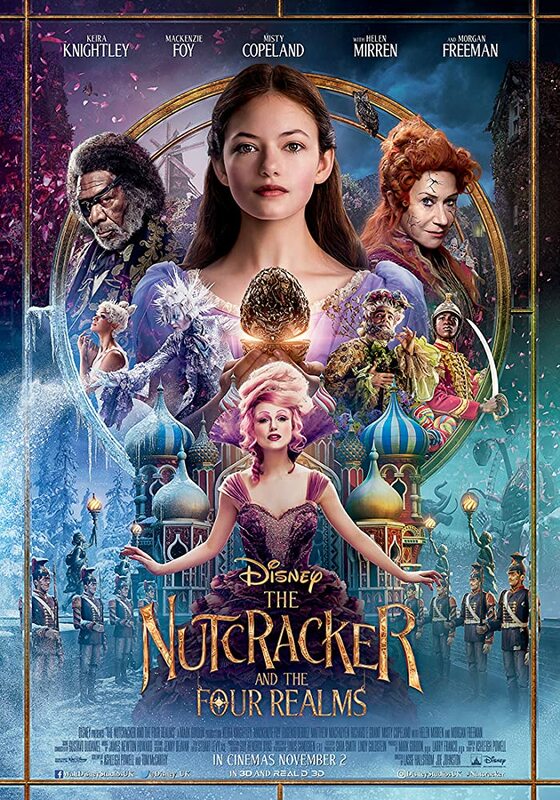 Mackenzie Foy, who plays Clara, is easy to root for even while not being particularly charismatic, and her nutcracker captain, Phillip, played by Jayden Fowora-Knight, is also generically appealing if not particularly memorable. I’d like to say, though, that I think both of these new faces have great potential. Believe it or not, Sugar Plum stole this movie. She crackled with electricity and proved very entertaining to watch. Oddly enough, I couldn’t place her–I couldn’t figure out who played this fairy. Imagine my surprise when the credits revealed Keira Knightly as Sugar Plum! I think this is probably my favorite part ever played by Knightly. I’ve never seen her so relaxed, magnetic, and … well, fun! Best of all? The ballet dancing! It should come as no surprise that they included quite a bit of ballet in this film. I found the inclusion of ballet inspired. They didn’t just toss it in for the sake of throwing it in there–it serves a real purpose to the overall story and looks fantastic. Again, the whole movie is really a sight to behold. While the story is full of adventure and even a little creepy at times, it’s incredibly intricate at all levels. Everything looks like a piece of art. Both of my kids enjoyed The Nutcracker and the Four Realms, though neither of them were “wowed” by it. Anytime we see a new movie, at least one of them usually says it’s their new favorite, but that didn’t happen this time. I’m not really sure why. In my opinion, you should certainly take your kids to see it. It won’t make their hearts skip a beat, but it’s still a very well-crafted family film that will probably please everyone, albeit in different ways.